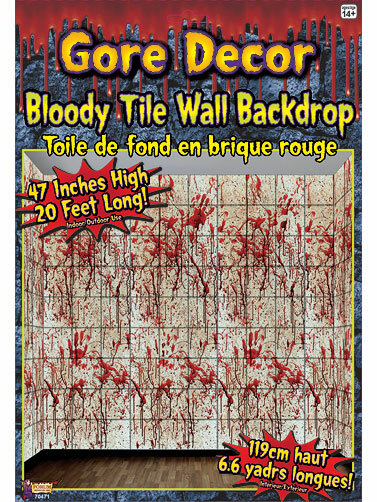 Create a gruesome scene such as a hospital or laboratory with this Bloody Tile Wall Gore Decor Backdrop. Thin plastic decoration for indoor/outdoor use. Hang with double-sided tape or sticky tack, not included. Transform an entire room with add-on images, sold separately. Image shown is using two packages for a complete wall covering. Bloody Tile Wall Gore Decor measures 47"H x 144"L (3 ft 11 in x 20 ft).